In ScreenshotMonitor the typical scenario is when a freelancer (or an employee) tracks their time and a manager looks at the submitted data on the ScreenshotMonitor.com website. But what if a company works on a project for some client with whom they’d want to share the same information? Or a freelancer tracks time for himself and then would want to share it with his clients? Easy! 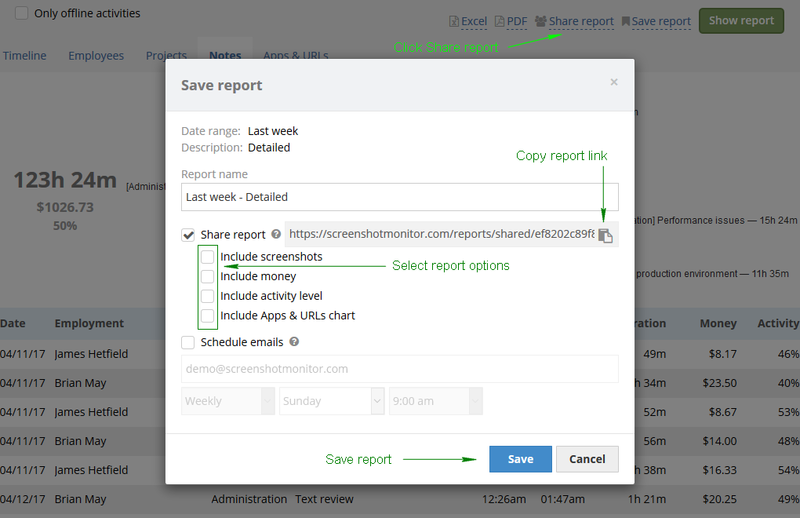 Go to reports, run it with any criteria you want and once you are satisfied with the results click “Share report” link. Copy the unique secret URL and send it to the client. The best part – no login required! Also there is no ScreenshotMonitor branding on that page – just your company name at the top. And if the data in this report changes – the page changes immediately as well. The reason is that every “shared report” is associated with a search criteria you had when you’ve pressed “Share this report” link – whatever satisfies that criteria (like “last week”) will be displayed on the page. You can choose what should be included in the report: Screenshots, money, activity level, Apps & Urls – just go to Saved Reports and click Edit to modify that. A similar need may arise when you would like to assign one of your employees to the role of manager so they would be able to see the timeline and report of assigned user – this can be done on your Team page. More details on management role.